Cyndy Gerken is another of the wonderful volunteer Field Editors from Taste of Home who have sent so many cookbooks to help rebuild The Culinary Cellar. Cyndy is from Florida, a kindergarten teacher, and now a generous giver of cookbooks. Cyndy wrote in the Joy of Cooking that the book meant a lot to her as it was her first as she learned to cook, and hoped I would love as did she. I certainly will, Cyndy! I am honored and thrilled to have it and give it a good new home. All of the cookbooks are great. 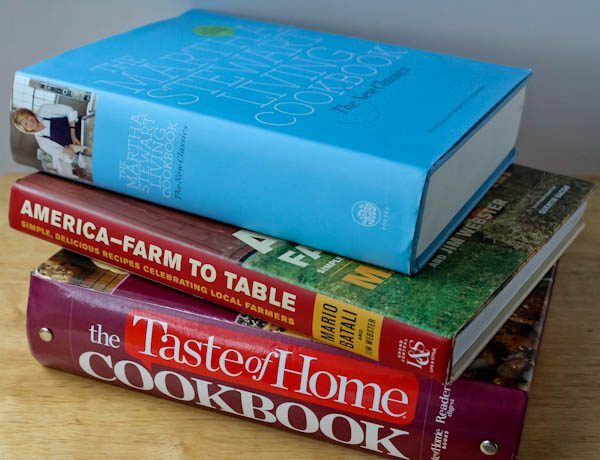 I love slow cooker ones, Martha Stewart’s New Classics looks amazing, and of course Taste of Home cookbooks are always filled with wonderful recipes from cooks all over the country. I hadn’t made a carrot cake in ages. This one got my attention because it had fresh ginger and Hellman’s Olive Oil mayonnaise in the ingredient list. Don’t be put off by the mayo. It does not have a mayo taste in any way and is so moist and tender. 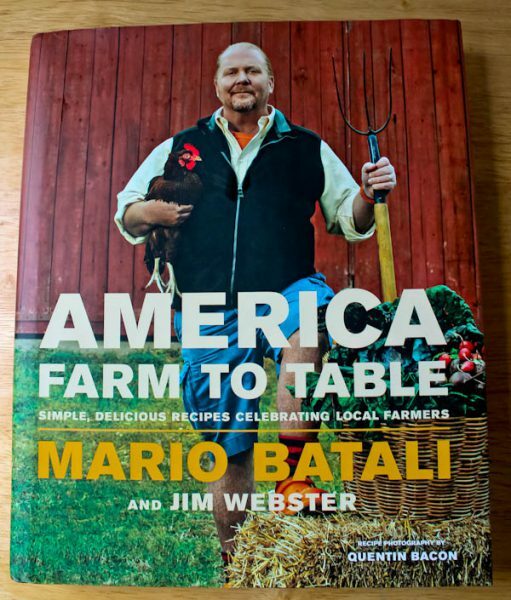 Since the chef specifically mentioned Hellman’s Olive Oil variety, I googled Mario Batali and Hellman’s and sure enough, he obviously was hired as a spokesperson for Hellman’s as there are many Hellman’s recipes from him. Some of you may remember back in the ’60’s when Hellman’s advertised a chocolate cake made with mayo and the response was usually ewwww! That is, until it was tasted. Mayonnaise makes it especially moist. 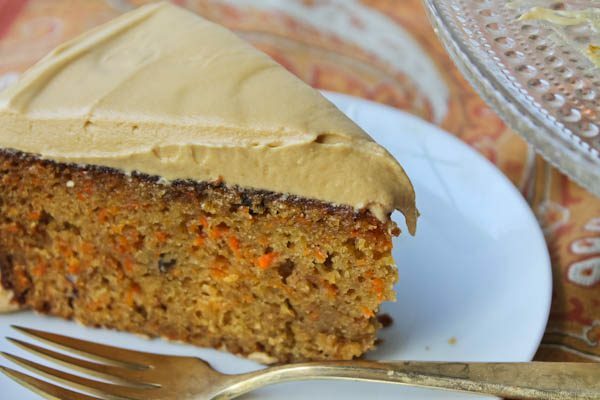 The cake has a cream cheese-butter frosting like most carrot cakes except the addition of a little molasses takes it to a different level. I have to say that this is best carrot cake I have ever tasted. Ever. It is now my go-to recipe. I wish you could taste it. 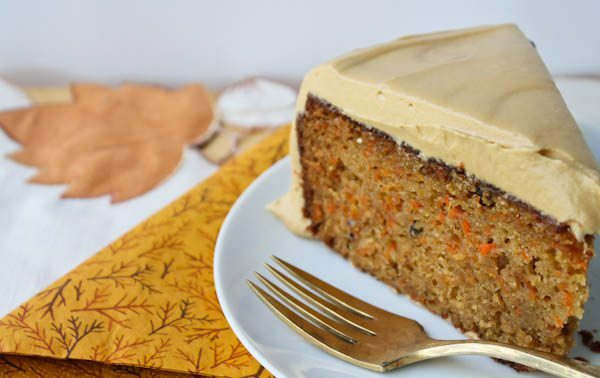 If you love carrot cake, it’s a must to try. The 1/4 cup of grated fresh ginger may sound like a lot, but it’s perfect. It just gives a subtle hint. Everything about this cake is perfect. Doesn’t it just look like a beautiful fall dessert? The frosting is the most gorgeous color, like shimmering gold. On another note, I read something on Cyndy’s Facebook page that connects us besides the love of cookbooks. We are both Barry Manilow fans. She will love this story: One Christmas my husband Bill, knowing how I loved playing my Barry CD’s in the car, made a special one for me. He took a photo of himself for the cover with the title “Songs from Billy ManofLove,” and switched it with Barry’s photo from one of his CD’s. How is that for sweet? So go make this cake – you will not be sorry. Listening to Barry while eating it is optional, but only I get to have Billy ManofLove. 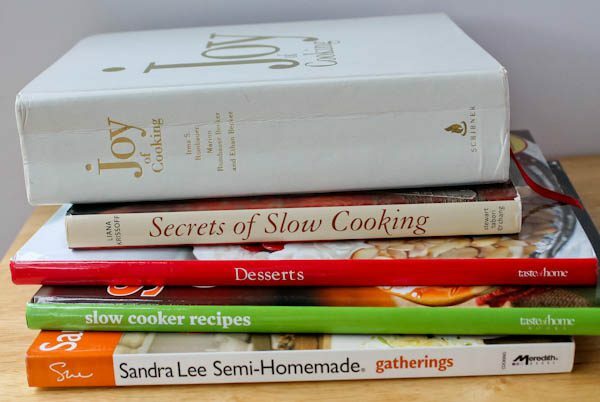 Thank you for these amazing cookbooks, Cyndy! In a large bowl, beat together the eggs, mayonnaise, granulated sugar, brown sugar, and vanilla. Mix in the flour, baking soda, baking powder, salt, ginger, and cinnamon. Stir in the carrots. Fold in the hazelnuts and pour the batter into prepared pan. Bake for about 40 to 50 minutes, or until a toothpick inserted into the center of the cake comes out clean. Let cool in the pan for 10 minutes, then turn out onto a wire rack and cool completely. For the Frosting: In bowl of electric mixer combine all frosting ingredients. Beat until mixture is smooth and creamy. Then frost top and sides of cooled cake. I must try that cake! Carrot cake is Steve’s favorite, and he loves hazelnuts or anything containing them. I see this as a perfect treat for him. I agree about the mayo. It makes a cake moist and adds something to the flavor without tasting like mayonnaise. I hope Steve loves it! Let me know. Love all your cookbook stories. What joy every package brings! And carrot cake is a favorite at my house. We had the most delicious carrot cake for our wedding which even the photographer, who eats lots of wedding cake, said was the best carrot cake he’d ever tasted. 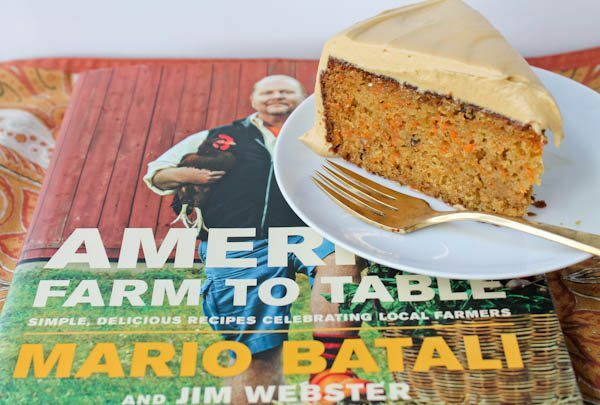 Our cake was made by a personal friend who loved baking and we have not found a better carrot cake recipe yet. Can’t wait to try your favorite. How cool that you had a carrot wedding cake! I doubt any recipe will ever be as good as yours! 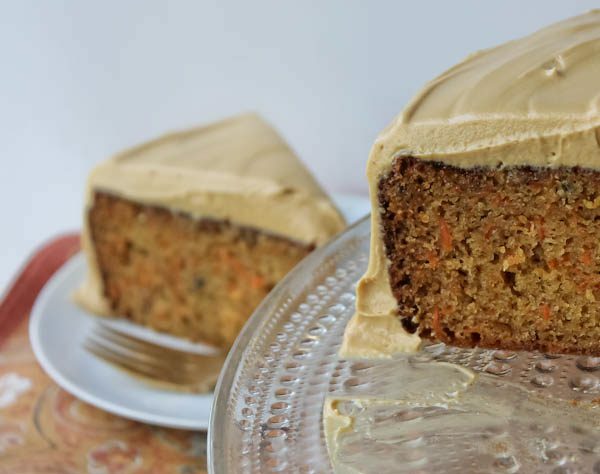 Love this carrot cake recipe, Debbie! I’ll have to try it! And as for Barry Manilow, he was my favorite too in his heyday! I even saw him in person once, but he seemed like he wasn’t in the mood to perform that particular night. I still love his music though, Time In New England, Copacabana, Mandy, I Write The Songs…..I love all of his music!!!! Hope you like the cake, Ronna. As for Barry, I love Daybreak, and When October Goes, especially singing in the car when I’m alone! Cute story about the Barry Manilow CD. Wow, that Bill is a keeper. Re the cake, sounds delicious. I looked up the mayo online. Did yours have 6g of fat per tablespoon? Thanks, Priscilla. Yeah, think I will keep Bill for another 40 years! Yes to your mayo question. Our Hellman’s is your Best Foods. I am so happy you are enjoying the cookbooks. What a nice surprise to find your story! That’s amazing that your hubby did that, yes I do love me my Barry! You are welcome, Cyndy! I had a great time writing about you!